- More as an obstacle than a helpful selling tool. - HE is what makes a sale happen, and if potential buyers use Matterport, he might lose a sale. - More disadvantages than advantages. He might get a few new listings, but lose some new clients he would have gotten with a regular visit. I have counter-arguments for all of his "issues", but I would be interested in reading yours. More as an obstacle than a helpful selling tool. Where's the obstacle?? an obstacle for the realtor maybe in having to pay to have it done??? - but people would rather have a MP tour vs not have one when viewing homes online - which everyone does these days. It's a helpful listing tool as well. HE is what makes a sale happen, and if potential buyers use Matterport, he might lose a sale. EGO???? I think it's the house that makes the sale happen personally. More disadvantages than advantages. He might get a few new listings, but lose some new clients he would have gotten with a regular visit. This is very possible - less calls to see in person means less potential visits for the Reatlor in person and less chance now for him to grab that buyer and keep them. I have gotten similar push back but it seems to come from Realtors "of a certain age" Not always but certainly the majority of naysayers are indeed. I call them like I call my father-in-law, " An analog man living in a digital world"
** Correct, nor do photos. Add drone footage as @pixelray said above. ** Again, if that is the feedback he's getting - it might be his demographic but I have to believe he's off here. ** If he was selling an impulsive item sure, a salesperson can "sell" you, however, if someone or a couple is looking to make one of the biggest investments of their lives, I think he's nuts. BTW - people don't like to be sold. ** That one may be true but if you want to do the best job you can for your client, and show their property in the most powerful way possible, and sell their home, you will get more clients from a referral of a happy customer than you might from random tire kickers. Not everyone that shows up to a house is a qualified buyer. I'd ask him 2 questions: Are his "feeling" confirmed by a large sample size of buyers and potential buyers and 2, if the service was free would he feel the same? I agree completely with PHILG...thanks for saving me midway through my response. Some realtors do not realize that listings are their lifeblood and they have to be able to show increased value to sellers. Twenty years ago, he would have been saying the same thing about online listings. Based on feedback so far from sellers on the virtual tours I have done for their realtors, they see tremendous value in a tour. Maybe we should be marketing directly to the seller not the realtor .... may have to ponder more on that possibility. This stat is pretty timely. Saw it on the Matterport Twitter feed. @PHILG is there any way of getting the source of that statement? I mean, anybody can say any percentage but it would be better if we had access to the sample size, where the research was done and who did it. We need compelling evidence to convince reluctant agents. I have been BEGGING for stats from Matterport forever. Crickets. I have realtors ask all the time "Show me some stats that show having a MP scan...."
@ArchimedStudio @pixelray @PHILG @Senojev @jfantin Thanks all for your insights, you guys obviously know your stuff, can put up a strong argument and still maintain a helpful and humorous attitude while you're at it! Sometimes that may actually be a blessing, if the sun aspect, neighbourhood or local area is not ideal or a desired location or just outside of a buyers desired location... they may actually fall in love with the property because of the VR tour and then be willing to compromise and take a look in person??! I would ask him how many people does he show the home he has listed? 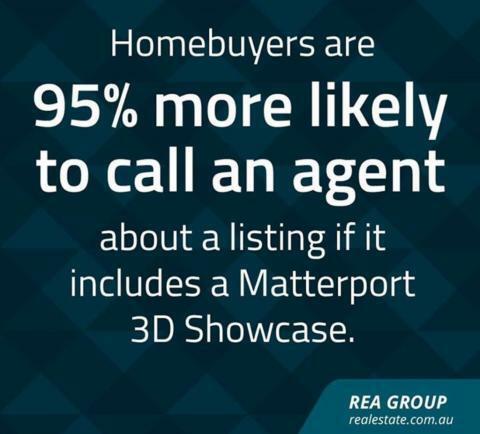 I thought that was the reason why everyone wants to be selling agents and not buyers agents. They want to stick a sign in the yard and wait for it to sell? In my area, most don't even want to do open houses. I had an old man tell me about the same line. I would rather show it myself than have everyone looking at it online. I asked him if he puts pictures up or just a front shot to get it on MLS. Why show them the pictures if you want to take them for a tour? I knew there was no winning, so I got my two cents in. I try and go for the younger agents willing to try different things then someone that has been doing it for 30 years. They think if it isn't broke, don't fix it. I offer to help them put flyers together, leads, etc. Some just take pictures, some get Matterport and others want both with help advertising on Facebook.